New to Region 13? Gather with other new Sweet Adelines at our First Timers' Class and learn about Region 13, the competition activities, and our traditions! Enjoy becoming familiar and comfortable by traveling through the contest traffic pattern and onto the stage of the Performing Arts Center. You will get a view from “your spot” on the stage and visualize your supportive and encouraging judges and audience. Your questions and concerns will be addressed to help you be in your comfort zone! We’ll also pose for a Region 13 “First Timers’ Class of 2017” Official Photo! The First Timers’ Class will begin at 9:00 am Friday, April 5 and will finish early enough for you to pick up a quick snack and be on your way to the Quartet Contest! 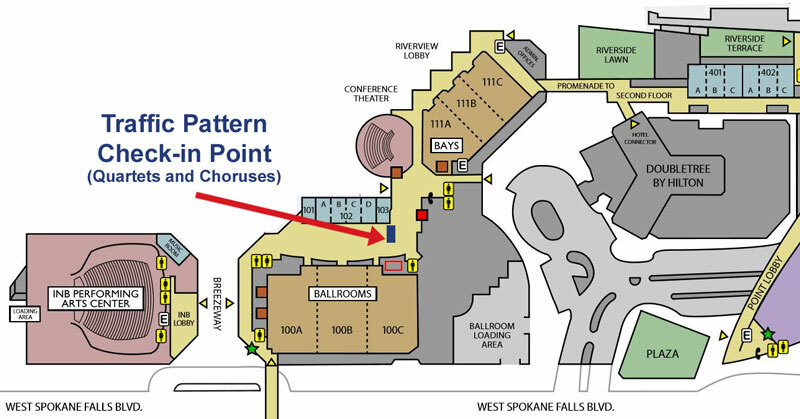 We will meet in the Convention Center at the Traffic Pattern Check-In Point (see map below), in the Convention Center Lobby. It would be nice if you can send us an email if you plan to attend, but there is no "official" registration for the class; just "come on down!" We are looking forward to this gathering as you share your new member energy and excitement. If you have any questions, just ask.